The number of international students studying in China continues to climb, reaching 442,773 last year, according to new statistics from the Ministry of Education, and putting it on track to reach its target of hosting half a million international students by 2020. 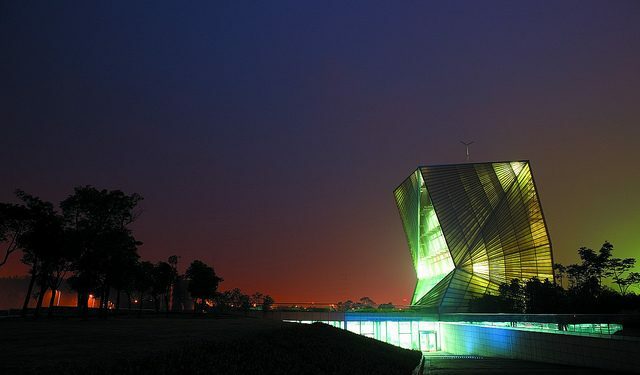 The University of Nottingham Ningbo China's Centre for Sustainable Energy Technologies. China's Ministry of Education partly credits the growth in international students to Sino-foreign universities in the country. Photo: UNNC. Korea was the top source country, sending 70,540 students, or just under 16% of all international enrolments. The US, accounting for 5.4% of all students, was the second-highest sending country with 23,838 students, followed closely by Thailand sending 23,044 students. 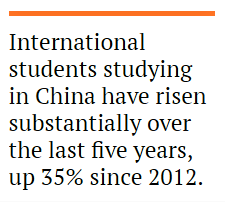 The number of international students studying in China has risen substantially over the last five years, up 11.4% from 2015 and seeing a 35% rise since 2012. Overall last year, students came to China from 205 countries, but Asia accounted for the lion’s share – around 60% – followed by 18% from Europe, and 11% from Africa. “A series of preferential policies drafted by the Chinese government for students from these countries have contributed to the remarkable rise in their numbers,” commented Xu Tao, director of the ministry’s department of international cooperation and exchange. This includes “10,000 places each year for students from countries along the Belt and Road Initiative to study in China under the support of the Chinese Government Scholarship,” he said. The One Belt, One Road initiative consists of a network of around 60 countries, primarily across Europe and Asia. Some 207,000 students came to China last year from the One Belt, One Road network, a significant proportion of which are attributed to the initiative. Speaking with The PIE News, Jennifer Weinman, executive director of Global Student Experience at the University of Nottingham Ningbo China, said the direct impact from OBOR to UNNC recruitment remains to be seen, but added, “it has certainly helped in advancing new opportunities for joint research, degrees and partnership development which support UNNC and its international recruitment opportunities”. In a speech last month, Tao acknowleged that “the internationalisation of education has been continuously improved”, along with the international status, influence and competitiveness of Chinese education providers, attributing this to the government’s efforts to promote development and carrying out educational exchanges and cooperation. “The scale of international students in China has been expanding, and China has become an important destination country in Asia,” he said. He nodded to foreign universities based in China, like UNNC, as shining examples of recruiting “outstanding international students”. These foreign entities in China currently enrol a total of 1,940 international students, students from over 70 countries and regions. According to Weinman, the growth of Sino-foreign universities have contributed to the growth of international students in China, alongside “the affordability of China for cost of living and study, and the safety and security of the many cities including Ningbo”. “I would anticipate some growth in English language degree programmes in China as well as more scholarships to be on offer in the future to further entice China as study destination,” she said. Weinman said UNNC has seen a “notable increase” in applications for undergraduate and postgraduate programmes from international students, and added that “interest in experience in China continues to grow across all countries”. In particular, UNNC has seen an increase in engagement from Nordic countries like Sweden, Denmark and Norway and from the African continent including nations of Tanzania, Ghana and Nigeria. 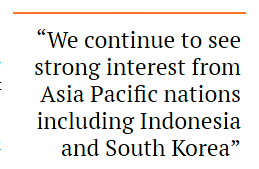 “We continue to see strong interest from Asia Pacific nations including Indonesia and South Korea as well,” she added. Tao’s comments reflected the government’s five year plan, that prioritises improving the quality of international education provision, and encouraging partnerships with foreign education institutions and enterprise. “By 2020 it is necessary to significantly improve the quality of study abroad, significantly enhance the effectiveness of foreign education abroad, effectively expand the breadth and depth of multilateral education cooperation,” he said. Contributing to China’s attractiveness is the recent extension of its post-study work regulations. Foreign graduates from Chinese universities with a master’s degree or higher, will be able to apply for work visas within a year of graduation. Similarly, those who are seeking to come to China for work who have postgraduate degrees can also apply for a work permit within a year of graduation.